McCain Defends Palin From "Feminist Left"
Republican John McCain and his supporters on Monday branded Democrat Barack Obama a liberal and criticized feminists and the media as they rallied their conservative base in Missouri, a hotly contested bellwether state, two weeks before the election. In a stump speech sharpened for the second week in a row, the GOP presidential candidate defended his running mate, Alaska Gov. Sarah Palin, against attacks from the "feminist left." And Sen. Lindsey Graham, R-S.C., introduced McCain by declaring him under siege by the "liberal elite media." "John's been there and he's met a little tougher people in his life than the liberal media," Graham said in an allusion to McCain's years as a prisoner of war in Vietnam. Taking aim at Obama, Graham implored the crowd: "Show us that you understand and see a liberal when he's standing out there in front of you. Make sure you show America that it does matter that you keep your word if you're president of the United States." The sharper remarks and tone came as McCain appeared before a weekday crowd of 2,000 in this suburb north of St. Louis, where Obama drew 100,000 on Saturday. Aside from several new key phrases and adjectives, McCain kept to his recent economic focus and the crowd failed to pick up on some of his standard applause lines. The Arizona senator did rouse the crowd when he reprised a line from the final presidential debate, during which he broke with his fellow Republican, President Bush. "We can't spend the next four years as we have spent much of the last eight: waiting for our luck to change," McCain said in an amphitheater at New Town, a planned community freshly built in a former farm field. "We have to act immediately. And as I said it at the last debate: I'm not George Bush; if Sen. Obama wanted to run against George Bush, he should have run for president four years ago. We need a new direction now. And we have to fight for it," said McCain. St. Charles County is fertile electoral ground for the McCain's campaign. In 2004, Bush beat Democrat John Kerry by a margin of 59 percent to 41 percent. As the nation moved right, Bush captured Missouri in 2000 and 2004, winning 53 percent statewide against Kerry, but this year the polls show a very close race in Missouri, which has voted for the presidential winner every year since 1900 but one, Adlai Stevenson in 1956. McCain was roughly trailing the same path Obama took through the state over the weekend. At midday, McCain stopped at a barbeque house in Columbia for lunch with small business owners. He labeled them "Joe the Plumbers, writ large," referring to the Ohio plumber McCain has made a focal point for his criticism of Obama's tax proposals. He appeared Monday evening at Belton, south of Kansas City, where Obama drew 75,000 on Saturday. Among those accompanying McCain was former Sen. John Danforth, an ordained Episcopal priest who remains widely popular in the state. 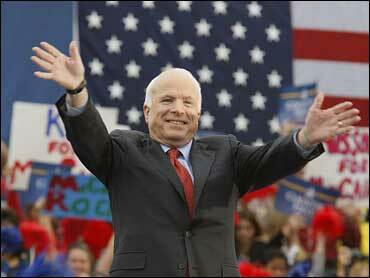 McCain opened his remarks in St. Charles by defending Palin against unspecified attacks. "My friends, it's remarkable the comments of the feminist left about Sarah Palin," he said to a chorus of boos. "I want to tell you, I am so proud of the way she has energized America. She is a reformer, she is a great leader, she is the most popular governor in America, and I can hardly wait to introduce her to Washington, D.C."
McCain's selection of Palin was most recently, and prominently, criticized by his fellow Republican, former Secretary of State Colin Powell. On Sunday, he said McCain's choice of Palin, whom he deemed unready to be president, factored into his decision to cross party lines and endorse Obama for president. Turning to Bush, McCain complained about "the explosion of government spending over the last eight years" that he said had "put us deeper in debt to foreign countries that don't have our best interests at heart. It weakened the dollar. It made everything you buy more expensive." In newly sharpened language, McCain also referred to actions he said Obama "will" take. Previously, he'd characterized these as actions he believes Obama "proposes." "If I'm elected president, I won't spend nearly a trillion dollars more of your money (on new programs). Sen. Obama will. And he can't do that without raising your taxes or digging us further into debt. I'm going to make government live on a budget, just like you do." And offering his view of the campaign with 15 days remaining, McCain no longer describes himself as 6 percentage points behind Obama; instead he said he was just a "few" back. Later, speaking at a high school football field in Belton, McCain latched onto a remark last weekend by Democratic vice presidential candidate Joe Biden who said, "Watch, we're gonna have an international crisis, a generated crisis, to test the mettle of this guy," his running mate Obama. McCain, who has argued Obama lacks experience, said, "We don't want a president who invites testing from the world at a time when our economy is in crisis and Americans are already fighting in two wars." Biden had drawn a different conclusion about Obama: "They're going to find out this guys got steel in his spine."